Pentax has got ahead of the game by announcing two low-end digital cameras in the run-up to CES - showing off the Optio P70 and the Optio E70. Priced at $200 (£137) and $130 (£90) respectively expect the features to include face recognition and a new 'Pixel Track' shake reduction. 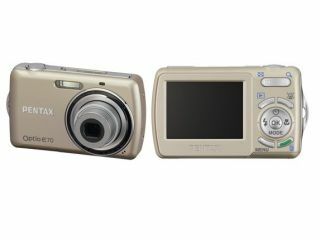 The Pentax Option P70 is a 12MP camera with a 720p video function to boot – and it also boasts 4x zoom, 28mm lens and 2.7-inch LCD screen. The cheaper E70 is a 10MP snapper with a slightly-bigger-than-stamp sized 2.4-inch screen and, judging by Pentax's use of words like 'easy-to-use' and 'affordable' is aimed squarely at camera 'noobs'. No further information is forthcoming on UK launch or pricing, but we'll keep you updated.